KIEV, Ukraine -- Ukraine’s government won’t push for a constitutional amendment to make Russian the second state language in Ukraine, Prime Minister Mykola Azarov said Monday, reversing an earlier push by the ruling Regions Party. But Azarov insisted on approval of a controversial bill that de-facto introduces Russian as the second state language in many Ukrainian regions. 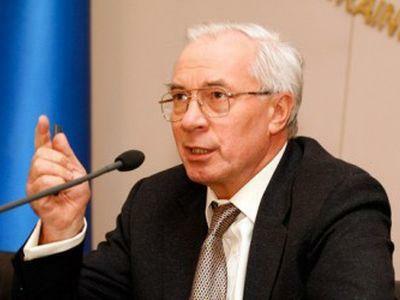 “We have so far been insisting on approval of the bill,” Azarov told NTV, a Russian television. The comment is a reversal of the government position from less than a week ago, when Vadym Kolesnichenko, a senior member of the Regions Party, said Ukraine is a bilingual country and this must be reflected in the constitution. The issue is extremely sensitive and explosive as the proposal would effectively split the country in two big cultural territories: eastern regions where the Russian language dominates, and western regions where the Ukrainian language dominates. The bill was approved in the first reading in Parliament on June 5, and the second – and the final – reading of the bill is expected either on July 4 or July 5, according to the Regions Party. Opposition groups have been preparing to disrupt the debate in order to stall its approval indefinitely amid concerns that the Russian language would start to replace Ukrainian in official government documentation in eastern regions. That may hurt the Ukrainian culture and even undermine the country’s political independence from Moscow, opposition lawmakers have said. Analysts see the bill, and the suggested constitutional amendment, as a way of energizing voters in eastern parts of Ukraine ahead of October 2012 parliamentary elections. The party is battling declining popular support due to stalled economic reforms and rampant corruption. The bill is seen by many as a tool to spark a new wave of support for the party in eastern and southern regions of Ukraine, where many people use the Russian language for everyday communication. The Constitutional Council, a panel of politicians mostly representing pro-government groups, is currently working on amendments to the constitution that President Viktor Yanukovych wanted to be approved within the next few years. At least 9,000 protesters turned out in front of Parliament on June 5 when Parliament, led by the Regions Party, voted to approve the bill in the first reading. The bill would almost automatically make the Russian language the second state language in Crimea, Donetsk, Luhansk, Kharkiv, Odessa, Mykolayiv, Kherson, Chernihiv and some other Ukrainian regions.